If you live somewhere that gets hot in the summer, the last thing you want to do is switch a conventional oven on so you can just warm up some food, bake a pizza or brown some toast. It could also be that you have guests coming and need an extra “pair of hands” so you can satisfy those hungry mouths. 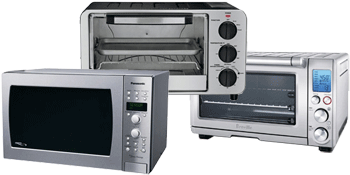 Of course, you can find convection microwaves (reviewed here), convection ovens (the Breville BOV800XL being my top pick) and a whole host of other appliances on my website, but this page is dedicated to toaster oven reviews. Below, you will find seven of my favorites! OK, so this might not be the cheapest toaster oven I have for you, but it’s well worth the investment. The main reason for this is that it comes with something called Element IQ Technology (you may have heard me mention this before with this manufacturer). What you get is 1800 watts of power output and four quartz elements that work differently depending on what you want to do. There are eight preset functions on this mini oven including: broil, roast, reheat, pizza (yum). You also have cookies, toast, bake and bagel which can all be selected using the dial at the top. The IQ Element Technology will ensure that heat is distributed evenly depending on what type of food you want to cook, since each of the selections above requires a slightly different “environment” so you get excellent results. 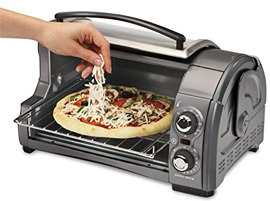 For the more basic cooking jobs, you can toast 4 slices of bread at one time, and this little oven will accommodate an 11 inch pizza without any trouble. Other features include an LCD display which lights up blue when the unit is not in use and orange when it’s preheating. You also get a rack which can be placed in one of three positions, a warming tray and pull-out crumb tray. 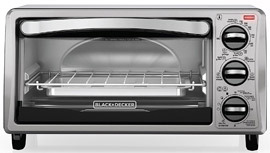 The interior (which is 0.45 cu ft) is also non-stick so you won’t have any trouble keeping this toaster oven clean. 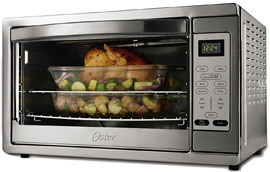 Do you need a toaster oven built to handle more than the typical toaster oven? Do you need one that can cook an entire proper meal, not just French fries, toast, or pizza? Whether you live in a small space, don’t have full-size oven, or need to cook meals on the run in your trailer or RV, this is the perfect all-in-one toaster oven. You can cook entire meals inside this thing. There is no need to limit the possibilities when you can actually cook a small turkey or chicken or rack of delicious baby back ribs inside. The extra-large size of this unit is what allows it to do all of these wonderful things. I have to be honest, though, it’s not as though you will be able to cook an entire feast for a large family get-together in here. It is, however, very good for cooking small family meals. It’s also great when you need to cook a ton of food and simply cannot create any more space in your regular oven. I was given a unit similar to this years ago and thought I would never need it. Let me tell you, this has come in more handy than I ever dreamed possible. Convection technology ensures that everything will be evenly and thoroughly cooked with no burnt edges or frozen centers. It also features an easy-to-use touch control panel and convenient LED display. Look, I have to admit that it doesn’t have some of the abilities that the more expensive ones have. For this price, though, how can you expect those options? The technology on this oven, like some of the others on this list, is rather basic and straightforward. Personally, though, when I just started out in the world of toaster ovens, I didn’t want something with a ton of options and a confusing control panel. I just wanted something with an easy-to-understand dial, just like the dials on this one. You won’t have to fuss around with fancy settings and options. All you will have to do is select one option from each of the three dials. The other two dials work in a similar, straightforward fashion. The second dial allows you to define your specific type of cooking – broiling, baking, toasting, or simply keeping something warm. The third dial controls how long the oven cooks. Foods which require you to check them now and then to determine if they are ready are best for the “stay on” feature. The same can be said about foods you are trying to keep warm. There are also options for perfectly timed toast as well as a specific number of minutes. 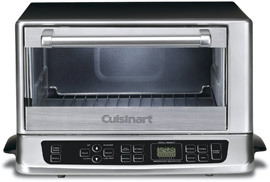 The TOB-40 Toaster Oven from Cuisinart is just about as classic as it gets with this type of appliance. It’s stainless steel in color with clean lines and a nice looking glass door with a cool touch handle. I like the idea behind the handle because as we all know, toaster ovens can get on the hot side. You also benefit from an auto slide out rack which makes loading and unloading food a real breeze! The controls are a dial design and rubberized for easy grip. However, if your eyesight isn’t what it used to be, you might have trouble reading the functions. This toaster oven will allow you to toast to perfection, bake your favorite tasty treats and broil, and it even has a bagel function. You can easily bake an 11 inch pizza and make up to 6 slices of toast at a time. Aside from the included oven rack, you also get a broiling rack, baking/drip pan and the interior has been specially coated so it’s not hard to clean. Oh, and if things do go wrong in the kitchen this toaster oven/broiler also has an automatic shut-off. Overall, I think this model will look nice, does what it’s supposed to and will make life far easier in the kitchen. 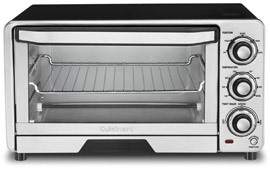 It’s pretty easy to see, right from the first glance, what makes this toaster oven unique – its shape. All of the other toaster ovens on this list (along with most of the toaster ovens in the world) feature a front panel which swings down, allowing you to pull your food out. Well, almost the same can be said for this one, but there are two huge differences. First, while all the others are flat panels, this one is curved. Second, this door opens upward. The curved design of this oven’s door exposes the rack when it is open; much like a bread box exposes your bread. This makes it easier to remove or season your food. Secondly, since this door opens upward it allows you fiddle around with your food without having the door in your way. I can’t tell you how many times I’ve accidentally burned my arm on the inside of the open oven door. I love this design. In addition to its unique design, this oven has a lot to offer. It comes with a slide-out rack which helps your food cook more thoroughly and is easy to clean. It also helps you remove food without having to stick your hands inside the machine. The easy-to-use dials also make your life simpler. There are no confusing control panels filled with hundreds of options (though I know some people prefer those). Instead, there are two simple dials – one which controls the temperature and one which controls the timer. I have to say this isn’t the biggest toaster oven I have for you, but then I can’t forget about people who live alone or people who have little space to “play” with in the kitchen. If you’re looking for a toaster oven that will help you cook up to 40% faster than your conventional oven, I think you might be interested in the Panasonic Flash Xpress. I will be honest with you, this oven will not handle roast chickens or bake a cake but what it has been built to do, it does very well. Design of course, might also be important to you and this toaster oven comes in silver or white and all the controls are handily placed beneath the door. You get 1300 watts of power but the best thing about this toaster oven is it uses infrared light to cook or reheat food. What this means is NO preheating which really does save time. There are six cooking menus and you also get a number of preset features as well. This little oven automatically calculates the amount of time you need to cook things like toast, bagels, muffins, and frozen foods and reheat leftovers. This can take a little getting used to but there is a 25 minute timer which can be adjusted prior to cooking. This model also has quite a large range of temperature settings from 250 to 500 degrees Fahrenheit. If you’re using it on the higher temperature settings I would advise you be careful about heat from the sides however, the front does stay relatively cool. Other features worth noting are the interior light and removable crumb tray. One of the first things that caught my eye when I came across this toaster oven was the design. I know looks are important to a lot of people when choosing an appliance for the kitchen, and I think it looks really good. This one comes from Oster and has a large capacity, so be sure to check the measurements before deciding on your purchase. It’s polished stainless steel which has been finished off in black accents, and all of the controls are digital so using this toaster oven is a breeze! One of the great features this oven has is the fact it uses convection technology so you get perfect results with toast, pizza, meats, fish and just about anything-else you want to cook in it. It’s large enough to accommodate a whole chicken and cooking casseroles won’t be a problem. Plus, this little beast will take up to 6 slices of bread at a time (great for the family at breakfast time). Oh, and you can choose how light or dark you would like your toast. The controls give you the option for one-touch functions which include: toast, bake, convection bake, broil, defrost and pizza. And, you can keep food warm as well. This toaster oven has a 90 minute timer with automatic shut-off and you also get two rack positions and a removable crumb tray. All in all, I think this is a great 2nd oven to have in the kitchen and it looks great as well. Budget is what I had in mind when I decided to add the Waring Professional to this review page and believe me, it’s very affordable! On the outside you get an appliance that’s very clean looking and finished in brushed stainless steel. All the control dials are neatly located to the right of the door so it’s easy to select which function, temperature and time you would like. You can bake, broil and of course toast with this oven and the manufacturer has also kindly included a “light to dark” option for your toast. Inside, there is 0.45 cu ft of space which will handle four slices of toast at a time and the added extras such as a baking pan, wire rack and broil pan make every-day cooking as easy as 1, 2, 3! The rack can also be placed at one of two levels which will help if you’re cooking something that’s on the taller side, and you can also make use of the 30 minute timer which incidentally will shut the unit off automatically when it’s finished. 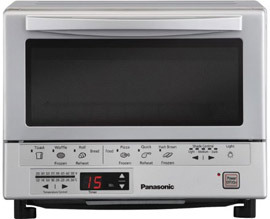 1500 watts of power output and a temperature range from 150 to 450 degrees Fahrenheit make this little toaster oven pretty powerful as well. Overall, if you’re looking for a toaster oven that will efficiently complete all the every-day cooking jobs you have, I think it’s worth taking a peek at this one. Do More Than Just Toast! This toaster oven isn’t last on my list because it’s not any good. Quite the opposite in fact! For a start, it looks very professional with a stainless steel/black design and wide clear glass door with top opening. The controls are on their own pad at the bottom of the unit and are digital, including an LED display which can be used as a clock. From here, you can select all manner of functions including: pizza bake, broil as well as defrost, bagel and reheat. You can also adjust the temperature and since this toaster oven will take 6 slices of bread you can choose from 4 to 6 and select the level of darkness you want. I love this little feature because not all of us like really crispy toast! 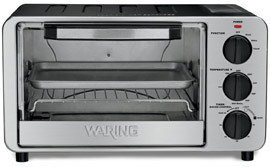 Apart from toast, as said this oven has the ability to broil and bake so all manner of foods can be prepared in it. The manufacturer has also included a heat sensor for more precise cooking so you get perfect fish and meat every-time. Personally (and I know it’s your decision) I think this toaster oven will look nice on your countertop, is very efficient and will easily become your second oven in the kitchen. If you would like to know more about any of the toaster ovens I have included on this reviews page for you, feel free to take a look at (one of the most reliable online retailers I know)!